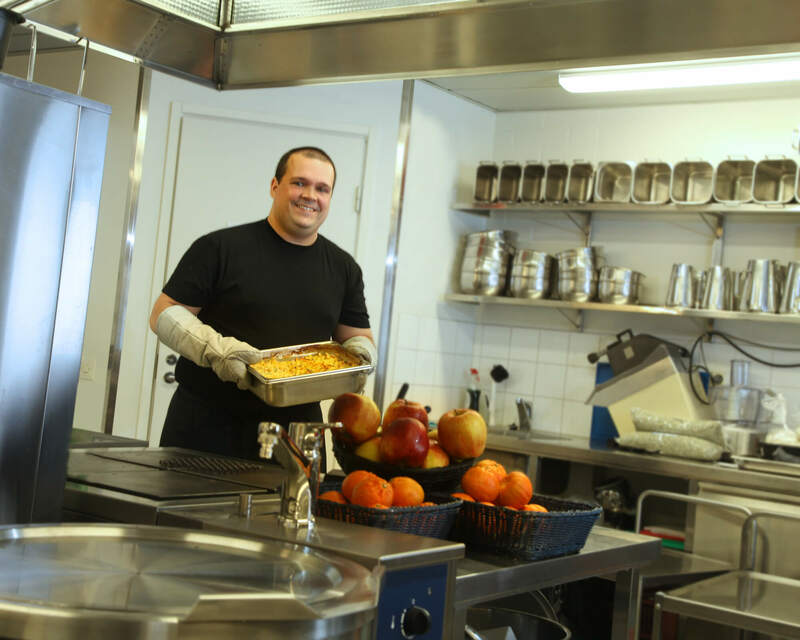 At our daycare centre we have our own food preparation philosophy. The food served should be tasty – the children should eat it and enjoy it. We vary our menu according to season and avail of local produce. In our kitchen, food is prepared from scratch, from ingredients to table. We do not use processed food products. We eat vegetables that are grown locally, we eat fresh fish that swims in nearby water, we eat berries from our forests and bread that we either bake ourselves, or buy from a local bakery. We base our food culture on the attitude that food is delicious and that it’s fun to try new dishes. Although a new dish might seem strange at first, you can discover something delicious just by tasting it! We encourage good table manners and discuss together what that is all about, and how we can best enjoy our mealtimes together. Our children know that their meals are prepared in our own kitchen. They know our chef, Tobias and our kitchen assistant, Maria, who are both important people at our daycare centre. Quite a lot of special diet food is also prepared in our kitchen. If your child has food allergies or special dietary needs, please show a doctor’s certificate to our kitchen staff, so they can plan the menu options accordingly. We serve breakfast, lunch and an afternoon snack. The menu we follow can be found here on our website. It is updated every four weeks. Occasionally we serve something that isn’t on the menu, if the groups have been allowed to request a special dish. In that case, the groups take turns to give a special request and we then have a special menu one day of the week. This is a fun tradition that means a lot to the children.